We have always looked at tilt-wall as an evolving artform. There are many things that we considered pushing the envelope a decade or two ago that are now commonplace or outdated. At Seretta, we take our role as an industry leader seriously and are constantly looking for and trying out potentially new and better ways to perform our work. We know that if you become complacent, you will become outdated. At Seretta, we use only the latest and most advanced chemicals, equipment, software, methodologies and technologies so that we continue to produce the highest quality work in the shortest amount of time. 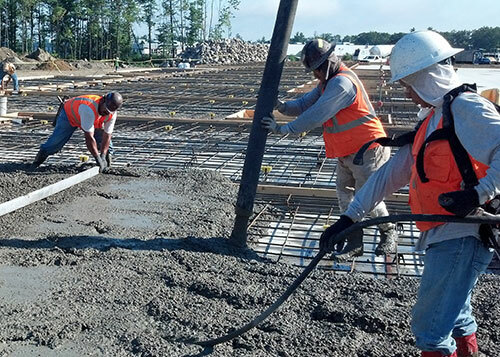 We provide turnkey concrete packages on any size project. We don’t consider anything too large or too small. We not only perform the complete concrete package on tilt-wall projects, but we will also perform large foundation packages or paving packages. We also work on projects requiring high tolerance floors or heavy industrial floors with toppings such as trap rock, quartz or iron. Whether it’s insulated tilt-wall, multi-story tilt-wall, radius tilt-wall, heavily detailed architectural tilt-wall or just simple tilt-wall, we have the craftsmen, knowledge, experience and financial strength to help you have a successful project.